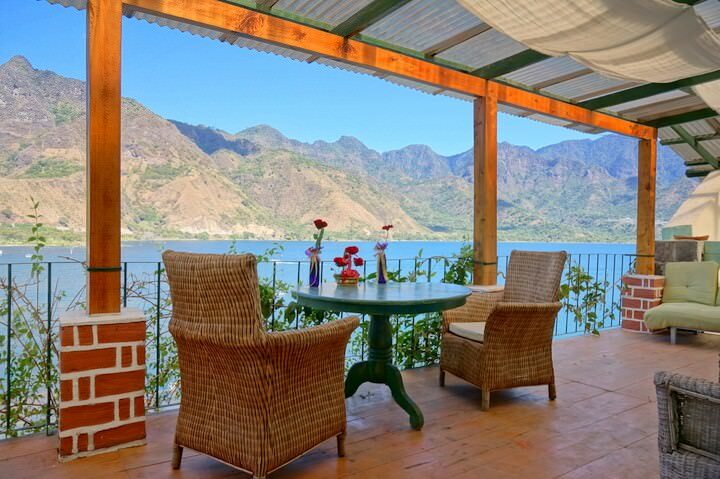 Lake Atitlán, Guatemala has long been a popular hangout for hippies, backpackers, expats and travellers. And, after living on the lake for two months in early 2015, we can definitely see why! 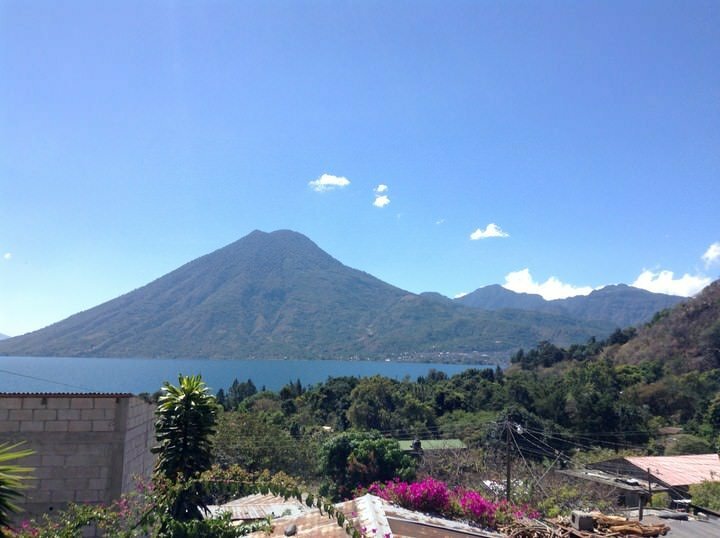 There’s just something about Lake Atitlán that gets under your skin, and ultimately makes it very difficult to leave. Lago de Atitlán as it’s known in Spanish, is the deepest lake in all of Central America and is flanked by three towering volcanoes – Tolimán, San Pedro and Atitlán. There are many Mayan villages surrounding the lake, but there are really only a few that you are likely to visit / relocate to indefinitely. 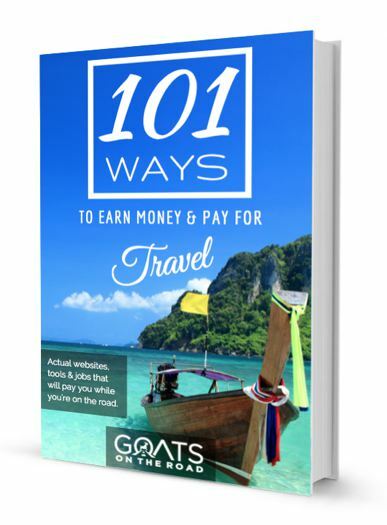 Please note: We travelled Lake Atitlan on a budget and this article reflects that. If you’re looking for more upscale accommodation and tours, check out LuxuryLatinAmerica.com. Let’s start with the most popular backpacker village on the lake. Panajachel (Pana for short) is the main port of entry to the lake, and if you’re coming from Mexico, Antigua or Guatemala City, this is probably where you’ll find yourself first. It’s a bustling, dusty village, with a very busy main street. Due to the fact that this village is connected to the road to the “outside world”, there is also a lot of traffic here. 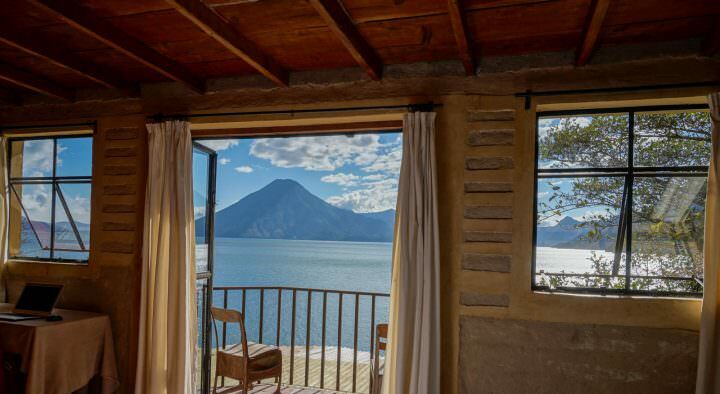 Whether you’re a traveller or someone who is looking to live on Lake Atitlán for a few months, Pana will likely be of interest to you, at least for a short time. This is where the biggest grocery store is, as well as “Sandy’s” supermarket, which sells a plethora of Western goodies. 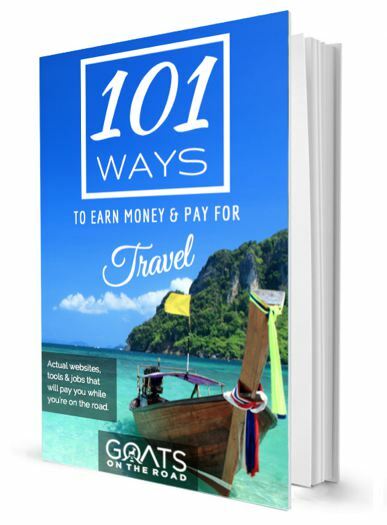 If you’re looking for tour agencies, transfers to Antigua and beyond, a wide range of hotels, many western restaurants, lots of bars, good nightlife, and affordable Guatemalan handicrafts, this is the place to find it. We do suggest visiting Pana and even staying here, but we highly recommend that you take a lancha (taxi boat) and check out some of the many (more authentic) villages, surrounding Lake Atitlán. Northern end of the lake, the village of Solola is north of Pana, most of the other villages of interest are west of here. Kayaking, bar-hopping, go on day trips to nearby villages, visit Saint Francis Church, take Spanish lessons, visit the market. Lots of tourists, busy streets, a mix of people – foreigners, Spanish and (beautifully dressed) Maya people. Views of all three volcanoes. NOT a very clean place for swimming. This is one of the few places where you can take out money from an ATM on the lake, stock up in Pana! The best grocery stores are here. A reliable tour agency for booking transportation is Xocomil, located right near the lancha port. Just a quick, 10 minute boat ride from Pana and you’ll arrive here. We lived in a suburb of Santa Cruz called Paxanax for two months and absolutely loved it. This is our favourite village on the lake. It’s true that we may be a bit bias, but with no road access, Santa Cruz manages to retain its secluded, tranquil charm. Rickety, bamboo platforms are raised out of the water on stilts creating a funky kilometre-long walkway along the shoreline. Now that’s a beer with a view! Paxanax was a great place to live for 2 months. There’s not a whole lot to do here in terms of sight-seeing, but for such a small, secluded village, there’s actually a lot of other activities to enjoy. The swimming in Paxanax is good, the CECAP program is very impressive and there’s a Spanish school as well. Check out the actual village of Santa Cruz at the top of the hill (take a tuk-tuk or a strenuous walk) and enjoy the stunning vistas! Just a 10 minute boat ride to the west of Pana, on the northern shore. Go scuba diving (the only dive shop on the lake is located here). Hangout at La Iguana Perdida hotel (happy hour, BBQs, backpackers) and enjoy wholesome food at Hotel Isla Verde. Visit the Saturday morning market. Go kayaking. Check out CECAP, one of the best pro-economic programs on the lake. A very quiet, peaceful village. No attached road to Panajachel or roads outside of the lake. Many local Mayan people. There are no ATMs here, and no grocery stores. Stock up! San Marcos is the place to go if you’re into healings, meditation, yoga, massage and all things spiritual and holistic. But it’s not just a place for spirituality and yogis, this is also one of the most beautiful villages on the lake. Narrow cement pathways meander through lush trees and flowering bushes, and the swimming here is good as well – there’s even an area for jumping off the rocks. The view of San Pedro Volcano from San Marcos Village. The restaurants in San Marcos are plentiful and the food is generally very healthy. The only downside is that it’s quite expensive compared to the other villages around the lake. There are a couple of small shops here and there are local vendors selling produce. You can walk from San Marcos to the village of Tzununa in about 15 minutes as well. A boat ride from here to San Pedro is only 10 minutes. Yoga, meditation, massage or reiki. Attend a spiritual gathering, go swimming, volunteer, go walking, hiking and day-trip to nearby San Pedro. A peaceful vibe, lush areas, no bars, but many good restaurants. Views of the towering San Pedro Volcano. There’s no ATM machine here. Don’t walk between here and San Pedro as there is a high occurrence of robberies along this route. This small village is often overlooked by tourists, which is too bad. Sure, it’s not as busy as the likes of San Pedro, San Marcos or Pana, but there’s something special about San Juan. The people living here are very friendly, it’s a safe village and the views are lovely as well. This village is serene and peaceful. There are only a couple of places to eat and to stay, but we recommend Hotel Uxlabil for food and for a night’s stay. From San Juan, you can easily walk to San Pedro, or take a quick tuk-tuk ride, which is what also makes this village so great. Beautiful Top Level Veranda At Uxlabil Eco Lodge in San Juan. West coast of the lake. Wander around town, visit the church, take a day-trip to San Pedro, relax. Hardly any tourists, friendly locals, an authentic feel. There are only a couple of small restaurants. 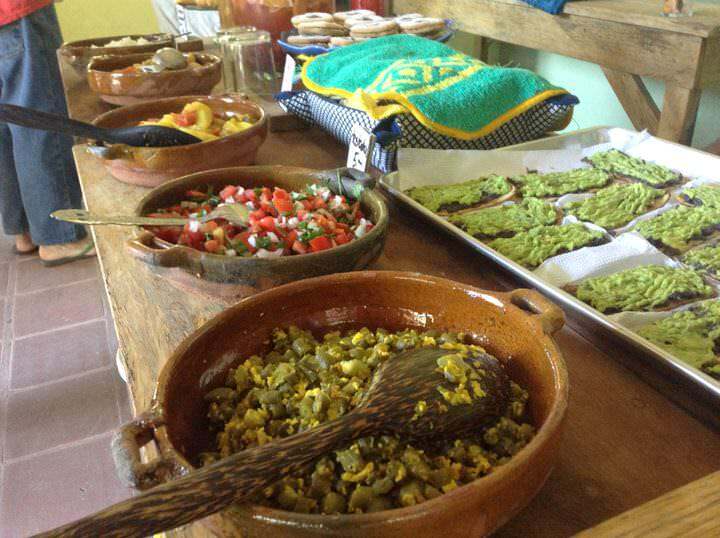 The food at Hotel Uxlabil is good, or you can buy some small items at the shops and cook for yourself at your hotel. The swimming here is not good. A lancha boat from Pana going to San Pedro will drop you at the dock in San Juan if you ask. No ATM. This is the budget backpacker hangout on the lake. There’s a direct road out of the lake from here and the vibe is great. This village has a main road running along the shoreline, which is where you’ll find all of the backpacker necessities: shops, tour agencies, restaurants, bars and hostels. 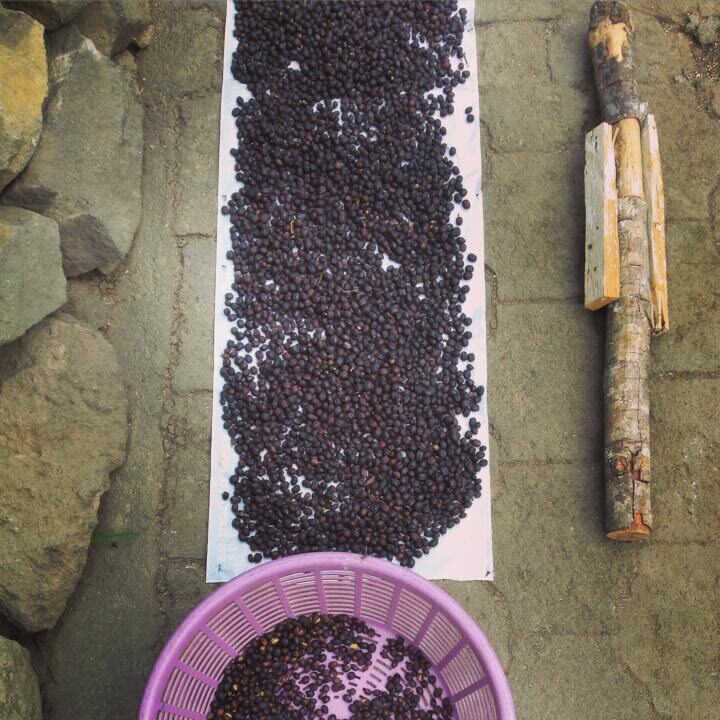 Coffee beans drying on the street in San Pedro. Heading up the very steep hill from the road along the lake, you’ll find what seems to be a separate village, this is where the locals live, and is definitely an area that you’ll want to check out. There are lots of things to do here in San Pedro, whether you’re interested in chilling out in hammocks, going to bars, learning about coffee, buying incredible artisan goods, learning Spanish or trekking up volcanoes, this is the village to come to. If you only had time to visit one village, this would probably be the one that we recommend – it has a little something for everyone. Western shore, at the base of the San Pedro Volcano. Day-trip to San Marcos for swimming, visit the church, visit the local produce market, hangout on decks overlooking the water, go to bars, meet other travellers, learn about how the local coffee is produced. 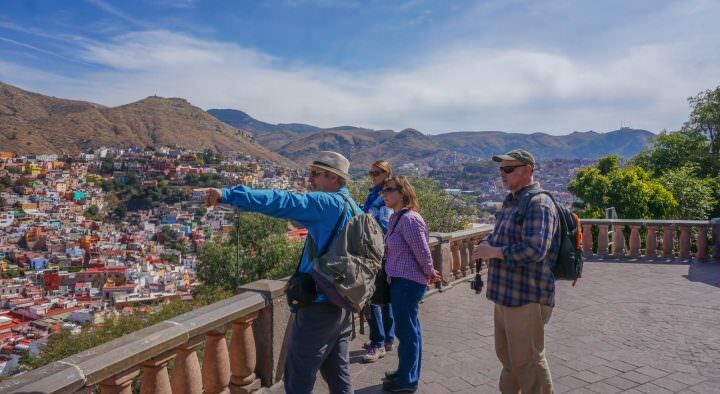 Hike the San Pedro Volcano and Indian Nose lookout. Lots of backpackers, a busy village, many restaurants/cafes/bars, friendly locals, beautiful views – but not of volcanoes. The swimming here isn’t good, head to San Marcos. There are a couple of decent grocery stores here for self-catering. There’s an ATM. Although not many travellers stay here, this village deserves a special mention as well. Jaibalito is located just a few minutes west of Santa Cruz. In fact, you can actually walk there on a high mountain trail, or, it’s a quick boat ride. There are hardly any people living here or tourists staying here, but there are a few expats and friendly locals. There are also a couple of hotels to stay in. Check out the Wednesday Jaibalito Market and Le Casa del Mundo for a drink on a beautiful patio. Santiago Atitlán is the most populous village on the lake, with the majority of the people being Tz’utujil Maya. Located on the very south of the lake, on an inlet between the Tolimán and San Pedro Volcanoes. This is a very traditional, authentic village, one that every visitor should see during their stay. Friday and Sunday are the main market days, but visiting any day of the week would be good. Food for sale at the Jaibalito Market. Some areas are not safe for walking, consult with a local before trekking between any of the villages. Generally each village is safe during the day, but the paths between them are notorious for robberies and muggings. If you thought humans are the only mobs bothering tourists at night, you’d be wrong. Packs of stray dogs have been known to attack unsuspecting people, especially late at night. Always travel with more than one person after dark and consider carrying pepper spray. The boat drivers have an “official” tourist rate for boat rides. You can find a sign stating the main routes in San Pedro, but if you don’t know the prices, they’ll probably try to rip you off. Use the price guide above and don’t pay any more. Have you travelled to Lake Atitlán before? Which village do you think is the best? You’re welcome 🙂 Isn’t it a fabulous spot!? Hi quick questions, i arrive in Guatemala city 16.30, is it possible to get transport to Lake Atitlan on that day? or best spend the night in the city and head over in the morning? You could get a ride to Panajachel I’m sure – but keep in mind that the last boat leaves around 5:00pm, so you would have to spend the night in Pana. There are some good, safe hostels / hotels right near the hotel in G.C. if you need though. I know this sounds like a silly question but I noticed I don’t see a lot of locals wearing shorts. Would we bring too much attention to ourselves if we did so? We’re leaving on 3/24. Thank you so much for your advice! Hi! Are you still in Guatemala? You’re right, the locals are more conservative. You could wear shorts as a man, and as a woman, but I just wore capris, or loose pants with a t-shirt. I’m so excited I stumbled upon you guys! Your blog is awesome! I saw your episode when you introduced Santa Cruz La Laguna and I’m going there in a few months. You mentioned the Iguana Perdida and Isla Verde for hotel options. How far apart are they? I love the ambience of the Isla Verde, but there is more to do at the Iguana Perdida. Great post guys, thanks so much for all the info – helped us out before we travelled to the Lago. This is a great guide to the area, thanks! 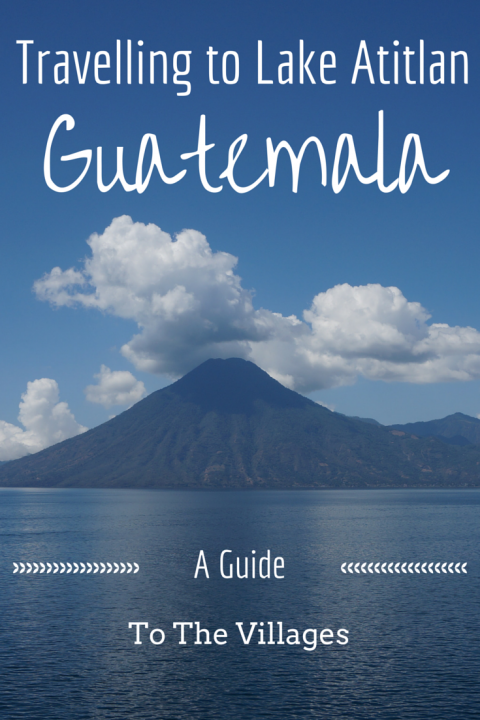 I’m headed down to Lake atitlan for a month soon and your guide is the best I’ve found! Ive referred to it several times while planning for my travels. Safe travels! San Pedro is a vortex beware! We were driving around Central America and when we got to San Pedro, life stopped. We felt it hard to leave. Every day we would wake up and ask ourselves…”so do you want to leave today?” “Nah… ” this went on for two weeks before we forced ourselves to leave. It’s beautiful! The best sunsets on the lake IMO. And there is a lot to do. We loved Lake Atitlan and San Pedro was on top for the villages we visited. Regarding dangers, do you mean that robberies occur on certain paths even during the day? Do you mean pack of dogs inside villages or only if you walk at night between villages? You can spent ages exploring all the pathways that’s split by the montain ridge from the more “towny” (CECAP) part of the place – the area between the pier and were you would “hike” up Jaibalito. If you stay on that side, you can even hike up the ridge (with the “towny” part on the other side and get really high up even looking down on those stairs to Jaibalito. It’s all quiet a maze and at times it doesn’t feel like your close to civilisation at all. Regarding robberies, I walked from San Marco to Tzunana yesterday, the main road (is there any other?) There a so many Tuk Tuks in both direction, like every two minutes, no one in their right mind would rob you there. There’s also no way for them to flee, it’s the road in either direction and that’s that. They’d be seen to easily and caught to easily. 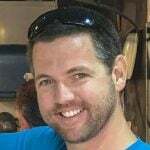 My husband and I will be staying in Guatemala for two months starting mid January. I’m a little nervous about waiting until we get there to find accommodations that fit our needs since it’s high season, so I’m starting to look online. I’ve checked out Airbnb & VRBO, but it seems like for a long term stay, both are a little out of our monthly budget range (< $600). Do you have any names of realtors or property renters you used who would be helpful to talk to? You can speak to the people at Atitlan Solutions (http://www.realestateatitlan.com/atitlan-solutions) and maybe they can help you out. I am just wondering if those prices mentioned above are still up to date? This is such a useful guide! I arrived in Panajachel tonight and was looking for villages to visit on a day trip tomorrow and this is definitely very helpful. I am still not sure what to do, but thanks to you I now at least know what the villages have to offer. I think I am definitely going to San Pedro and San Marco while I’m here at the lake, as these places were recommended by our guest house owner as well. And then I have to see. Good thing I can sleep over it and see what I feel like doing tomorrow. Enjoy the lake and all of the unique villages. Have fun! Loved this. I am leaving for Guatemala the 16th of Oct and will be there until Nov 6th. [Last was in Guatemala in the late 70’s] Plan to have about 5 days on the lake so it was great to see the different towns and sites. I like how you do your blogs with videos very much. Jaibalito is a small but beautiful and authentic village! Seems unjust to describe a town with hundreds of people as “hardly anyone living here.” Jaibalito is a gem with one of the best views of the volcanos on the lake.